Add depth - and height - to your flower arrangements with beautiful hosta leaves. Hosta leaves are a marvelous addition to floral arrangements. They are long lasting in water and offer endless variation in texture, shape and color. The fragrant cultivars such as Fragrant Bouquet, Guacamole and Stained Glass are especially nice as a cut flower. And these hosta flower scapes are long lasting too! Browse our Fragrant Hostas selections to view all the fragrant cultivars currently available. 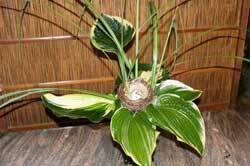 The number of uses for hosta leaves in floral arrangements is only limited by your imagination! 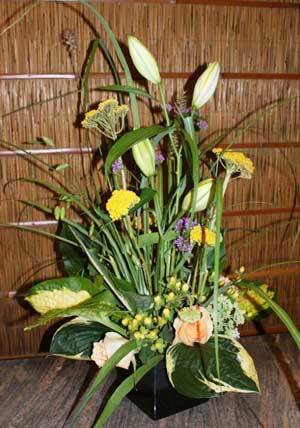 Pictured are a few arrangements from Greenery Designs in nearby Amesbury, MA. Floral Designer Terrence Gleason says they can be used in many styles of arrangements from traditional to Japanese. 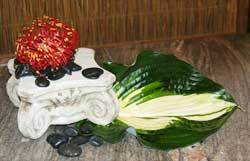 He especially likes to use hosta leaves in wedding arrangements! As this charming birds' nest arrangement shows! Design your own flower arrangements! Order Your Hostas Today!